A bill before Congress would for the first time require radio broadcasters to pay royalty fees to recording artists and record labels pursuant to the Copyright Act. The proposed Fair Play Fair Pay Act (H.R. 1733) would “[make] sure that all radio services play by the same rules, and all artists are fairly compensated,” according to Congressman Jerrold Nadler (D-NY). The bill would still allow for different fees for AM/FM radio, satellite radio and Internet radio, but it would mandate a “minimum fee” for each type of service for the first time. A February report from the U.S. Copyright Office cites the promotional value of airtime as the longstanding justification for exempting terrestrial radio broadcasters from paying royalties under the Copyright Act. In the traditional view of the market, broadcasters and labels representing copyright owners enjoy a mutually beneficial relationship whereby terrestrial radio stations exploit sound recordings to attract the listener pools that generate advertising dollars, and, in return, sound recording owners receive exposure that promotes record and other sales. Second, a leaked trove of emails from the Sony hack showed that the MPAA continues to pursue their dream of blocking websites that contribute to copyright infringement. With the failure of SOPA in 2012, the lobbying organization has pivoted to trying to accomplish the same ends through other means, including paying for state attorneys-general to attack Google for including some of these sites in their index. Over at TechDirt, Mike Masnick argues that some of this activity may have been illegal. The reality is that opposition to SOPA-style controls continues to remain strong in the tech policy community. The only people in Washington who support censoring the Internet to protect copyright are paid by Hollywood. If, through their generous war chest, the MPAA were able to pay a “respected” tech-sector advocate to build policy support for site blocking, that very fact would cause that person to lose respect. Moreover, on a technical level, the MPAA is fighting a battle it is sure to lose. As Rick Falkvinge notes, the content industry had a unique opportunity in 1999 to embrace and extend Napster. Instead, it got Napster shut down, which eventually led to decentralized piracy over bittorrent. Now, it wants to shut down sites that index torrents, but torrent indexes are tiny amounts of data. The whole Pirate Bay index was only 90MB in 2012, and a magnet link for an individual torrent is only a few bytes. Between Bitmessage and projects like Bitmarkets, it seems extremely unlikely that the content industry will ever be able to shut down distribution of torrent data. Instead of fighting this inevitable trend, the MPAA and RIAA should be trying to position themselves well in a world in which content piracy will always be possible. They should make it convenient for customers to access their paid content through bundling deals with companies like Netflix and Spotify. They should accept some background level of content piracy and embrace at least its buzz-generating benefits. They should focus on soft enforcement through systems like six strikes, which more gently nudge consumers to pay for content. And they should explicitly disavow any effort to censor the web—without such a disavowal, they are making enemies not just of tech companies, but of the entire community of tech enthusiasts and policy wonks. In 2012, the US Chamber of Commerce put out a report claiming that intellectual property is responsible for 55 million US jobs—46 percent of private sector employment. This is a ridiculous statistic if you merely stop and think about it for a minute. But the fact that the statistic is ridiculous doesn’t mean that it won’t continue to circulate around Washington. For example, last year Rep. Marsha Blackburn cited it uncritically in an oped in The Hill. 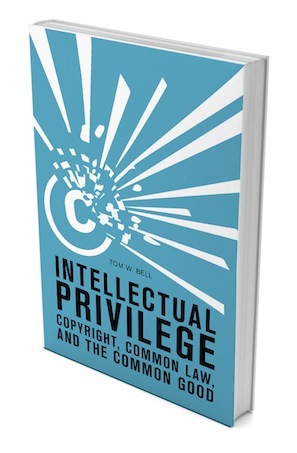 In the past two years, a spate of misleading reports on intellectual property has sought to convince policymakers and the public that implausibly high proportions of US output and employment depend on expansive intellectual property (IP) rights. These reports provide no theoretical or empirical evidence to support such a claim, but instead simply assume that the existence of intellectual property in an industry creates the jobs in that industry. We dispute the assumption that jobs in IP-intensive industries are necessarily IP-created jobs. We first explore issues regarding job creation and the economic efficiency of IP that cut across all kinds of intellectual property. We then take a closer look at these issues across three major forms of intellectual property: trademarks, patents, and copyrights. As they say, read the whole thing, and please share with your favorite IP maximalist. The House Subcommittee on Communications and Technology will soon consider whether to reauthorize the Satellite Television Extension and Localism Act (STELA) set to expire at the end of the year. A hearing scheduled for this week has been postponed on account of weather. Congress ought to scrap the current compulsory license in STELA that governs the importation of distant broadcast signals by Direct Broadcast Satellite providers. STELA is redundant and outdated. The 25 year-old statute invites rent-seeking every time it comes up for reauthorization. At the same time, Congress should also resist calls to use the STELA reauthorization process to consider retransmission consent reforms. The retransmission consent framework is designed to function like the free market and is not the problem.